Well, the response has been overwhelming… and our hotel is booked! Thankfully, the Comfort Suites, which is next door, has offered a few more rooms. Their group rate for us is $89 a night. Call 317-791-9610 to get your reservation. Give them the bride’s name — she’s holding the rooms — and have the rooms transferred to you. So I know we’ve been telling everyone to visit the Children’s Museum, but here is an even better reason: If you get to town during May, you can get adult admission for the kids’ price. Here’s a link to the coupon: http://www.childrensmuseum.org/may-discount. We recently got our initial e-mail from the DJ, so music has been on the mind. An important question for guests: What kind of music do YOU want to hear at our reception? What songs remind you of either the bride or the groom — or both? The RSVP cards have begun rolling in, and we have surpassed the point of 50 guests who will be joining us on our big day! I guess that’s a vote of confidence in us getting hitched, huh? With the help of some loving family and friends, I just successfully completed assembling, stuffing and stamping all of our wedding invitations. (I already spent a weekend writing addresses — my hand was cramped from that for sure!) This weekend was a lot of work, but they look beautiful and I can’t wait for all of our guests to see them. Our invitations were designed by Shelby Murphy Geidner and printed by CMC Printing and Graphics in my hometown of Midlothian, Va. Adam & I love working with talented people and local vendors. We recently had the opportunity to take part in a Tobit marriage preparation weekend at the Our Lady of Fatima Retreat House in Indianapolis. The weekend brought us closer together and closer in faith. It provided important reflective time to really focus on our relationship and the challenges and joys we will share during marriage. We felt refreshed, at peace, and excited for our marriage! We would highly recommend that all couples take the time out for a retreat. It can be a formal one or just some “us time” one weekend where the phones are turned off and other chores are put away. Consider it. In an earlier post, I promised to explain Walter. Walter is the little rubber ducky you probably noticed in the corner of our Save the Dates. Adam’s aunt Nadine is a nun, and she had a special religious anniversary celebration at her congregation outside Chicago. We made a point of attending, and the family members all stayed at a Hampton Inn near the church. 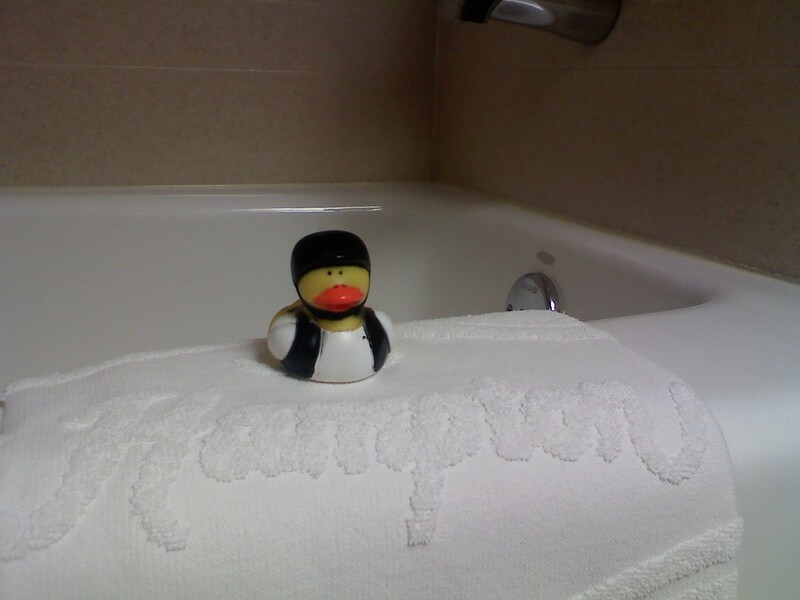 The hotel liked to add cute touches to its rooms, so in each bathroom there was a miniature rubber ducky perched atop the folded bathmat on the tub. Ours looked like a biker duck. Other people’s ducks, we found, had other careers and hobbies, as indicated by their attire. Somehow, Adam decided the duck’s name was Walter. 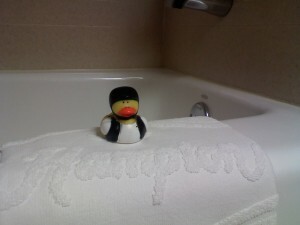 And once you’ve named a rubber ducky, you can’t exactly leave him to languish in a hotel all alone. So I took him home, and Walter began traveling regularly with me when Adam & I would meet up during our long-distance courtship. We now have some bride and groom duckies, too, but we still keep Walter. I am so glad to hear that so many of our guests liked the save-the-date cards we put together. They’re a bit like an “I Spy” game. Well, our save-the-date cards are on their way to you, our guests. I really hope you like them — I designed them myself. See how many items you can find that represent Adam and I and our relationship.